When construction was completed in 1931, the Empire State Building stood as the world's tallest building for nearly 40 years and was named as one of the Seven Wonders of the Modern World. 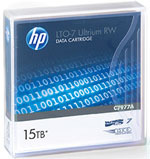 Building the HPE LTO Ultrium family was a tall order for HPE LTO -7 Ultrium data cartridges. However, with 15 TB of storage capacity and blazing fast 700 MB/sec transfer speeds, HPE LTO-7 Ultrium is up to the challenge. Tested to extremes, HPE LTO-7 Ultrium ensures data and archive needs will always be flying high. Completed in 1931, Christ the Redeemer, the largest art deco statue in the world, watches over the city of Rio de Janeiro, Brazil and was voted one of the New Seven Wonders of the World in 2007. 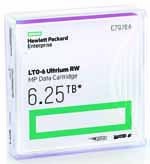 A workhorse of the HPE LTO Ultrium family, HPE LTO-6 Ultrium data cartridges watch over your customers’ critical data. Both the metal particle (MP) and Barium Ferrite (BaFe) versions feature 6.25 TB of storage capacity and 400 MB/sec transfer speeds, Tested to extremes, you can trust HPE LTO-6 Ultrium to keep critical data safe. The VW Touareg that drove from the Czech Republic to Cape Agulhas on the tip of Africa journeyed through deserts, over mountains and across rivers, all with a HP LTO-6 cartridge fixed to its roof. And at the end of the trip, the cartridge still worked flawlessly. So whether your data originates on an oil rig, a film set or just down the road, you can be certain it will reach its destination safely when it’s stored on HP storage media. Because when we say HP goes the extra mile to keep your data safe, we really mean it.